[ Indians of Patagonia, Chile, greeting a European traveller, probably Louis Antoine de Bougainville. ] - FERRARIO, G.
Title : [ Indians of Patagonia, Chile, greeting a European traveller, probably Louis Antoine de Bougainville. ]. Size : 7.7 x 10.4 inches. / 19.5 x 26.5 cm. 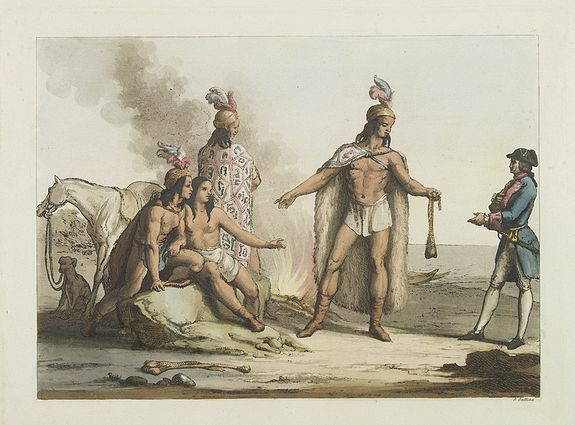 Description :Aquatint depicting Indians of Patagonia, Chile, greeting a European traveller, probably Louis Antoine de Bougainville. Comte de Bougainville was a French admiral and explorer and visited the region in 1766.